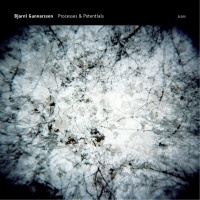 Processes & Potentials is the work of Icelandic composer Bjarni Gunnarsson. Gunnarsson works with process based ideas and Processes & Potentials is concerned with internal activity and motion. The sounds are intricate and detailed but it's the drone that underpins much of this, cut with glitches, static surges, fizzing tones, and micro tones, both harsh and soft, that makes the entire thing sound cohesive. On 'Aukera' textured tones scrape and crackle with quieter passages of atmospheric hum, which shimmer and circle. It's physical, almost like Pan Sonic's experimental noise, but there are no dance beats or obvious melodies on Processes & Potentials to make this palatable. Processes & Potentials is deeply immersive due to its intricate blending of micro detail. Sounds appear and reappear in what may appear an almost indiscriminate manner, but as Gunnarsson states "On this album it is important how sound processes behave, how they relate and how they occur. The seemingly organic sound-world of the work is all created from ideas that favour process-based approach to sound and composition." You could listen to Processes & Potentials on random, and the effect wouldn't be diminished, as Processes & Potentials is unified by its use of drones and tones. You can hear that in the following 'Portholes' which carries the crackling and atmospheric hum from the previous track, which at points is like raindrops falling into a industrial hinterland. At other times the sound is much more grainy. Even with its cut-ins and drop-outs there's a fluidity and a constant sense of motion, largely as a result of the drone that runs through most of this. For all of its theorizing, Processes & Potentials isn't even a dry listen. Much of it tends towards harsher sounds, sometimes dropped-in abruptly alongside some hazy droning atmospherics. There's much here that noise and experimental listeners would enjoy. While much of Processes & Potentials tend towards abrasive sounds, 'Momentaries', starts off more serene with its airy atmospheric hum like oozing gas, as gentle shimmers contrast with the industrialised factory noises and crackling textures. The changes in sound get sharper, and more explosive before its cuts back to the atmospheric hum. The hum continues through 'Signac' but here it's riddled with fizzing effects and reverberating tones. Much more processed sounding is 'Concomitance' with its filtering of sine waves, against a deep, pulsing tone. Brief snatches of airy atmospherics and harsher tones break through to provide a direct lineage to earlier tracks. The final piece, 'Pedicel', moves from harsh panning drones littered with hiss and crackle, which cuts to an assemblage of abrupt changing textures with a ringing atmospheric drone that gets progressively louder cut with abrasive layers.